Perfect sandwich for lunch! 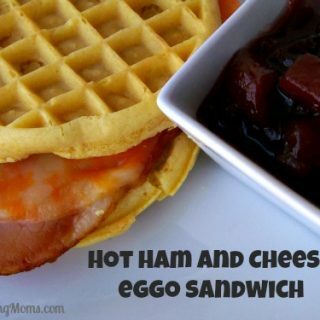 Hot Ham and Cheese Eggo Sandwich is a twist on the classic sandwich. Heat ham in microwave for 45seconds or until heated until your desired. Place waffles in toaster and heat according to package directions. Place ham on top of the waffles. Place cheese on top of ham and then place other waffle on top. I like to add cranberry sauce on my sandwich or serve on the side.